The above patient was treated with low level laser therapy for a nasty diabetic ulcer on the great toe. Despite the fact that the patient’s blood glucose was poorly controlled(averaging over 250) the laser treatment completely healed the foot ulcer. Eight visits between the image on the left and the image on the right. Low level laser therapy appears to be a safe and effective treatment for various types of neuropathy including some diabetic complications. The women to the above suffered an outbreak of shingles (far left). 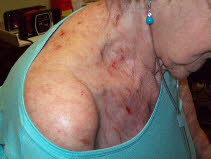 After treatment in our office, 6 visits, note only a few lesions remain. Best of all she suffered no post herpetic neuralgia. 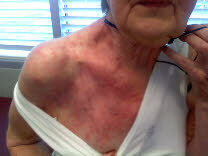 Post herpetic neuralgia is a common type of neuropathy that is commonly associated shingles. Low level laser and other combined treatment were used.